Angina pectoris is a term that describes chest pain caused by myocardial ischemia – a condition in which the amount of oxygen getting to the heart muscle is insufficient. It usually occurs on exertion and is relieved by rest. Angina generally is a symptom of coronary artery disease. In most severe cases, it may occur with minimal effort or at rest. 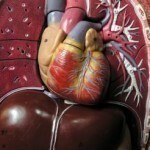 The coronary arteries are small arteries that carry blood to the heart muscle. This blood flow provides the oxygen and nutrients needed by the heart itself so that it can keep pumping. If the heart has to speed up (for example, during exercise or periods of excitement) and cannot get the blood it needs, it will send out a signal in the form of angina. The three major coronary arteries are the: left anterior descending artery, left circumflex artery and right coronary artery. Most people with angina have blockages in one or more of these arteries and/or their branches. A more unusual type of angina is caused by spasm (sudden contraction [squeezing response]) of the smooth muscle within the coronary arteries. This condition is called variant angina pectoris (also known as “Prinzmetal’s angina” or angina inversa).Variant angina pectoris does not occur when the heart has been overworked. Instead, variant angina comes on almost exclusively when a person is at rest or asleep, often between the hours of midnight and 8 a.m. The attacks can be extremely painful. This is not the same as atherosclerosis, although some people have both conditions. This is because the symptoms often come on at rest (or during sleep) and without apparent cause. Cocaine use/abuse can cause significant spasm of the coronary arteries and lead to a heart attack.